NEW! Water Calls - Fourteen songs, eleven original. 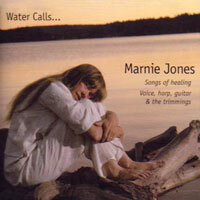 Marnie's vocal and guitar work with an all acoustic backup by some of Puget Sound's finest. Produced by Greg Scott and recorded by David Lange. Some stunning a capella work, too. 2001, CD.